The Upper Midwest Trail Runners is an organization for anyone who likes to run off road. Some of us are serious ultra runners. Others are recreational runners who seldom if ever enter a race. Our members like to run on dirt, grass, gravel, rocks, mud, snow—really, any trail that isn’t paved. We want to encourage more people to run trails and have fun before, during, and after runs. Our members support and conduct races and other running activities. Because we appreciate running on trails, we want to protect and support local trails and parks. In our experience, the trail running community is tremendously diverse, welcoming, and open. On the trail your speed, size, skin color, religious background, political leaning, or other differences carry no importance. You’re simply a member of the trail running family. The UMTR Board of Directors reject discrimination, bullying, and harassment of any kind as antithetical to the welcoming nature that we expect from the community and our members. We believe that those actions have no place in our events, or in the greater trail community. Trails should be a place where people can feel safe and welcome, and we hope that our trail family continues to be one of equality, acceptance, and respect. Our organization also promotes a number of trail race series offering some friendly competition throughout the running season. Members who sign up for the series can win annual prizes for overall or age-group performance. Jamison began running later in life (2010) as an attempt to get healthier. After years of pounding pavement, his wife encouraged him to get out on the trails. He ran a small trail race in Rush City in 2014, and set out to find other like minded trail people over the winter to train with. The 17 miler at Zumbro 2015 marked his first big trail race, and he fell in love with the trail community. 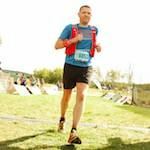 Jamison has completed a 50K and 50 mile ultra, but loves running shorter distances as well. He is often seen volunteering at races; anything to get him out among trail people. Jamison and his wife Lisa enjoy spending time outside as much as they can. They often travel around the state exploring new trails (and new breweries), and reconnecting with old favorites. Since then, I've decided that dirt is my happy place. (Gravel and snow are OK, too.) I've run a dozen or so ultramarathons, volunteered at a dozen more, and paced a few awesome runners. My goals are to find and share joy on the trails, and to keep running happy and sustainably. I blog at Better Than a Stick in the Eye and can usually be found engaging in witty banter on the Upper Midwest Trail Runners Facebook page. Tim started running in his mid-30s with his first marathon in 2007 and second in 2012. But it wasn’t until Zumbro 17 in 2016 that he discovered and fell in love with trail running. His first 50k was later that year and since then he has discovered the wonders of Superior, Afton and Hixon. 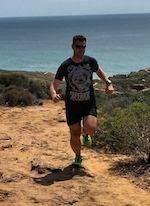 Tim continues to run both road and trail as he and his husband, Brent, work towards completing the World Marathon Majors. New distances lie ahead with his first 50 mile at Zumbro in 2018 and eyeing 100 miles in 2019. Tim looks forward to putting his many years of non-profit management experience to work for UMTR and continuing to volunteer at races. I have been running since 2014 and a UMTR Member for three years. I started running on the road but after a year or so on the pavement I discovered the Endless Summer Trail Series and after my first run at Lebanon Hills I was hooked. I have completed numerous races from Superior 25k and Eugene Curnow Marathon and I keep continuing to challenge myself on the trails. Last year I also completed the Squamish 50k in Squamish, Canada. I hope to run a 50 mile in 2019. My favorite part of trail running is the people. From the runners on the trails you meet, dedicated race directors and the numerous volunteers that give their time and energy to keep the runners going. I hope to give back to the running community for many years to come and running the trails. Carl Bliss discovered the trails when a friend invited him to try the Ice Age 50K a number of years ago. Since then he has enjoyed a variety of distances, running a number of ultra's with his wife Katie. Katie and Carl are raising 3 girls in Minnesota's St. Croix Valley. He enjoys being close to a number of great regional and state parks. Carl has run trail races in Minnesota, Idaho, Wisconsin, and New Mexico and will always try to sneak away from a business trip to find local trails anywhere he travels. Carl enjoys getting together for group runs, and introducing others to the sport, and will still laugh when a coworker tells him they "wouldn't drive that far". I am a classic example of adult onset running. While I ran short distances for fitness throughout much of my adulthood, I didn’t train for and enter my first race until my 40’s. 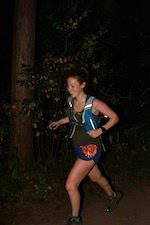 I’ve always run a mixture of roads and trails and I ran my first trail race at Trail Mix 25k. That race lead to the slippery slope of longer distances, as the Afton 50k and Spring Superior 50k were added to my calendar. I was taught early to give-back to the sport after I started running races and connecting with the Twin Cities running community. Course marshaling at TCM, race photography, working aid stations, course marking, and course sweeping are among my favorite things to do at races when not running. A few years ago, I adopted a few sections of the Superior Hiking Trail to maintain, and I love helping at the SHTA sponsored trail work weekends in the spring and usually jump at the chance to do trail work elsewhere. Loren has been running trails for about 25 years. 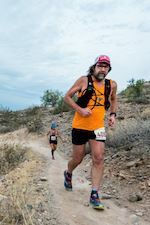 He ran his first 50K race at the inaugural Afton Trail Run in 1994, and over the years he and his wife Pam have spent many weekends and evenings together on the trails at Afton. Whether running in summer or snowshoeing in winter, it was always fun to meet up with old and new friends on the trail. Never an athlete and never blessed with speed, Loren has been fortunate to have the opportunity to complete many marathons and 50K races with Pam on beautiful trails in Minnesota and elsewhere, including some of the "famous" trails of California. 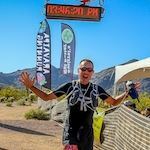 In recent years, Loren and his creaky knees have been drawn to the shorter races highlighted by the UMTR Trail Run Series, where he has enjoyed experiencing new races and meeting new runners and volunteers. 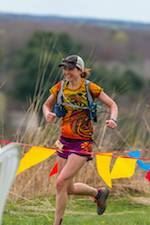 After moving up to Minneapolis in 2016, Kate got lost on the trails around Cedar Lake on her usual road half-marathon training loop and fell in love with dirt beneath her feet. One Full Moon Afton group run later and she was hooked on dirt. 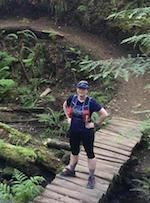 Slowly working her way through longer distances, Kate has completed everything from a trail 5k to a 50 miler, and is hoping to attempt her first 100 miler in 2018. Loving volunteering as much as competing in the race itself, Kate can often be found at aid stations, either dressed in a hot dog costume at Zumbro or dumping buckets of water on people’s heads at Voyageur. Kate is lucky enough to live surrounded by excellent trails in the Twin cities, but loves getting up to the Superior Hiking Trail and also exploring new trails in lesser known state parks in Minnesota and Wisconsin. Chris picked up running later in life in his late 40’s running all the local half marathons. 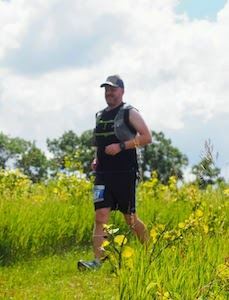 After running the Afton 25K in 2014 he was hooked on running trails. John Taylor, a college friend of his wife Smokey, was volunteering at the Afton race and informed Chris that there are longer distance trail races. Given that inspiration Chris was excited to more of what trail running had to offer and registered for the Birkie Marathon in September and Surf the Murph 50K in October of 2014. 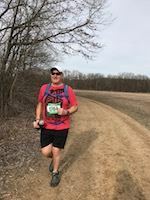 Since then, Chris has run two 50 milers and discovered that 50K and marathon trail distances are his favorites, running as many Minnesota and Wisconsin events as he can. In 2017 he completed the Transrockies 6 day 120 mile run in Colorado. His main goal is to meet, support and encourage others in the absolute joy of running trails.